Vision Mechanics is delighted to be bringing our first DragonQuest production to Monikie Country Park in October 2015. As well as encompassing more traditional elements of woodland sound and light shows, DragonQuest has many layers of mystery and magic that you can discover as you walk through the woods on an autumn evening. 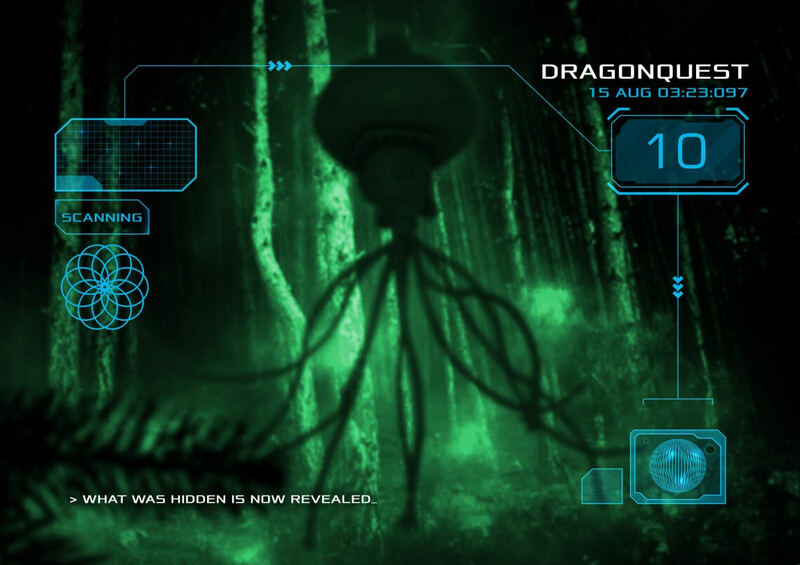 As you search for the ancient Dragon, you will find, in our interactive installations, more than one puzzle to solve and signs of more than just a Dragon in the woods. To assist you in your search we have developed the Dark Wood DragonQuest app for Apple and Android phones or tablets. Use the camera on your device to scan the area and reveal hidden animated mythical creatures! We will email you the download code so that you can use it to glimpse and capture a parallel universe of magical creatures that inhabit the wood – Fairies, Goblins and the dreaded Trolls. DragonQuest is an adventure suitable for all ages, though may not be advisable for children of a sensitive disposition. DragonQuest runs from 7 October to 1 November 2015.